Xara Designer Pro X combines graphic and web design, illustration, photo editing and desktop publishing – all in a single compact workspace. Powerful drawing tools allow you to draw lines, shapes, and curves using vectors and adjust scale without loss of quality. Your pictures look sharp right down to the finest detail. This is perfect for when you need graphics in various sizes for different uses! Browse through a huge selection of art brushes, then draw creative lines and turn each and every one of your images into a work of art. Discover the Online Content Catalog* with over 1 million freely available stock photos, graphics, illustrations and SmartShapes that you can easily access and use at any time. A massive selection of agency photos to choose from is included. Access a fantastic collection of graphic designs and illustrations. Select your favorite template, apply your own images and text – that's all there is to it! The Online Content Catalog** contains 240 website templates, so you're sure to find the perfect one no matter the theme of your website. The new Magic Color Match function offers unlimited options for customizing your projects. 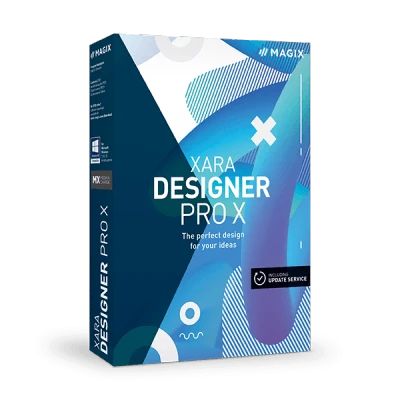 Xara Designer Pro X offers everything you need for a successful Internet presence, including 2 GB web storage and your own domain** - free for one full year! Display your website correctly on any end device – from PC to smartphone and tablet. It's easy and no programming knowledge is required. Use the full width of your website to present your photos. This showcases your images and makes your website an absolute eye-catcher. Expand the slider any way you want – either with a prominent call-to-action button or a customized header. You're almost ready for your presentation. Want to add graphics or create a unified layout? No problem. Xara Designer Pro X contains high-quality presentation templates in a huge variety of themes. This enables you to create a captivating presentation in no time at all. From quick snapshots to photo shoots: Edit your images directly in Xara Designer Pro X. Adjust brightness, contrast, color and saturation in images in no time at all or use 1-click optimization. For more precise results, edit the gradation curves for your photos or apply professional white balance. Present a photo differently each time. Simply select one of 140 photo filters in the Online Content Catalog* and apply it to your image with a single click. Create seamless photo collages. Select any template you want from the Online-Content-Catalog* and then drag and drop your pictures onto different positions. Is the horizon slanted in your photo? In Xara Designer Pro X you can simply use the "Straighten horizon" slider to adjust the position of the photo. With Xara Designer Pro X you can easily create multipage publications such as brochures, fliers, newspapers and business cards. Xara Designer Pro X includes all the tools you need for creating and publishing complex documents. The software makes dealing with even multi-page publications in different formats a cinch. When you need results, fast: The Online Content Catalog** includes a ton of templates that are 100% customizable, as well as over 1 million photos and graphics that you can use for your publications. Maintain the correct color right through the the final print. CMYK (cyan, magenta, yellow and key) support offers the exact hue you need for flyers, photos and documents. * 1 full year of access to the Online Content Catalog. After the first year has expired, the offer can be extended for a discounted price. ** The offer includes one domain with one of the following endings: .com, .de, .net, .org, .at, .be, .biz, .ch, .co.uk, .es, .eu, .fr, .info, .it, .name, .nl. After the contract is terminated, you may continue to use the domain(s) according to the applicable conditions (special offers are excluded). The offer is limited to a duration of 12 months and is renewed automatically if not terminated 8 weeks before the end of duration. The terms and conditions of The Xara Group Ltd. apply, which may be read at www.xara-online.com. The payment for the total amount is made at the time the contract is signed, and thereafter each time it is extended.